Hospitality management students in assistant professor Yao-Chin Wang's (front, blue jacket) Festival Management and Analysis class gained first-hand experience working with organizers and vendors at this year's War Eagle Fair. FAYETTEVILLE, Ark. – For the first time this fall, students participated in a new festival management course at the U of A with an emphasis on service learning and including a festival analysis component. Festival Management and Analysis was added to the curriculum in hospitality management by assistant professor Yao-Chin Wang. The service learning aspect of the course centered around the War Eagle Fair, a craft fair held each October featuring more than 250 booths along the banks of War Eagle Creek near Hindsville. This fall, students focused efforts on vendor visibility at the fair. "Service learning is the best teaching method for festival management and analysis," said Wang. "Festivals are cultural celebrations. Cultural elements and memories of local community are preserved at festivals. Without talking to artists and feeling the real festival environment in person, it's hard for students to deeply experience and realize the beauty and value of community. Working in a real festival is a good approach to learn important decision-making cases, such as bad weather and traffic management. The War Eagle Fair is organized by the Ozark Arts & Crafts Fair Association and many festivals are organized by nonprofit organizations. A service learning course design is a great opportunity to continue our land-grant and flagship responsibilities." With input from Cole Seal, media and social media coordinator for the fair, student groups managed vendor visibility for 50 to 60 booths. Each group scheduled and made posts on the fair's official Facebook page to promote vendors. "During final presentations, hospitality students suggested in addition to creating social media posts, they could help shy vendors interact with fair attendees or help by watching their booths when they are using restrooms or having lunch," said Wang. "One group even developed an app, showing the feasibility of incorporating fair information, vendor stories and gamification for engaging children. The variety and depth of Facebook posts for vendors improved a lot this year. Students used photos, and created videos and time-lapse photography." The program in hospitality is offered as a major in hospitality management major and as minors in hospitality management or event management through the School of Human Environmental Sciences in the Dale Bumpers College of Agricultural, Food and Life Sciences. "This service learning project was a great way to have hands on learning," said hospitality management student Emilee Hammond. "Having interactions with my classmates outside of a classroom and getting to meet wonderful people are memories I will never forget. Having such a wonderful learning experience at the War Eagle Fair will keep me coming back as long as I'm in Arkansas." Student groups also presented solutions to fair management issues, such as pet policies and how to attract children to the fair, proposed by Executive Director Katie Templin. Templin and President Fred Sutton judged and provided feedback to the presentations. "I think it is an incredible place that brings family and friends together and allows them to view one-of-a-kind products and see the hands that made them," said Sloan Clay, another hospitality student. "I loved getting to help with vendor visibility and am very thankful for the opportunity." Wang received grants from the U of A's Service Learning Initiative, and the Teaching and Faculty Support Center to assist in establishing the class. "I am very grateful for the warm support from the War Eagle Fair board of directors, especially Katie, Fred and Cole," said Wang. 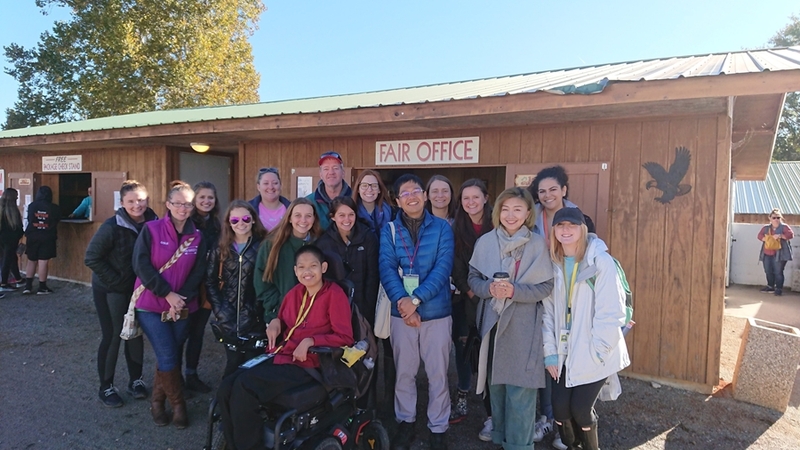 "Katie and I had several meetings to discuss ideas on how students could apply what they learned in class to service learning at the fair. I am also very grateful for the grants and other support and valuable assistance in making this class possible."